A few months after re-introducing me to Dungeons & Dragons, my friend Paul suggested we visit Backlist Books in Massillon for an afternoon of gaming in the then-newly-relaunched Gamma World. It was the first time I had sat down with a group of strangers (except for Paul, of course) for a role-playing session. We had enough fun that Fred, owner of Backlist, started a Sunday afternoon Gamma World campaign in a setting of his own creation. It lasted several months, and when we’d completed that quest, Fred asked if I’d be interested in joining one of his Wednesday night D&D Encounters groups. I started in September 2011, and over most of the next year, I played through three adventures with two different groups, and I was learning Pathfinder in the fall when Fred broke the news that the store would be closing at the end of 2012. Besides gaming, there was always plenty of conversation about books and movies and TV and video games and (for us older folks) 1980s pop culture and alternative music. Fred and I also talked running in the months leading up to the Canton Marathon. Since becoming a Backlist regular, I made a real effort to order new books through the store and reserve Amazon for buying other things. That’s a Handmade By Fred eight-foot bookcase, now in its new home here in my office. (I did have to fire up the circular saw and lop off about 5 inches from the top, since the room’s ceiling height is only 93 inches.) It’s even constructed with an angled base, so it’s nice and stable. 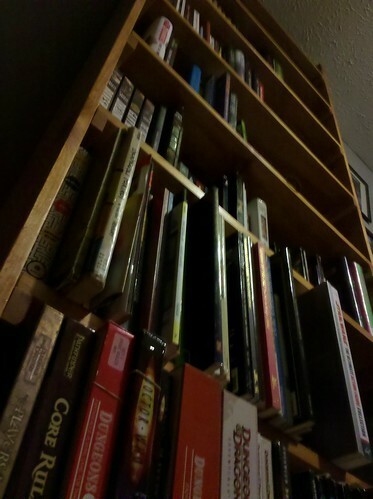 I also really dig having a bookcase with a top shelf that – for me, anyway – requires the use of a small stepstool. There’s a lot of space on those shelves occupied by bits of former Backlist inventory – books from several editions of D&D; science fiction new (Ready Player One; The Inexplicables) and old (Gateway; At the Mountains of Madness); TSR “Endless Quests” books to replace the ones I bought in middle school and lost long ago; John Green, and Jim C. Hines, and a pulpy-covered paperback collection of vintage Star Wars comics. All in all, a fine reminder of a few years of really good times.